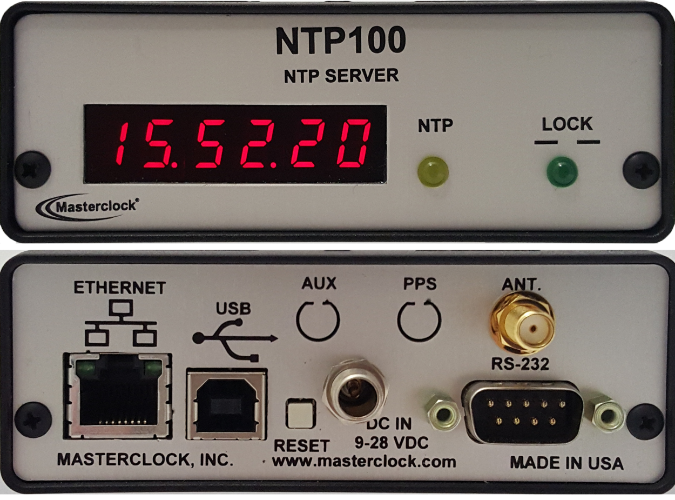 NTP100-GPS Stratum 1 NTP Time Server — Masterclock, Inc. The NTP100-GPS is an NTP (Network Time Protocol) server that synchronizes to GPS satellites and distributes NTP reference signals via Ethernet. When synchronized to the atomic clocks in GPS and GLONASS satellites, the long term accuracy of the device is the same as the atomic clock of the GNSS. An internal TCXO (temperature-compensated crystal oscillator) provides holdover stability of ± 1 min/year during GPS signals loss. An optional OCXO (oven-controlled crystal oscillator) increases holdover stability to ± 250ms/year.